Shoes are preowned and do have scratches, scuff marks and staining throughout both shoes. As well as creasing and scuffing to front outer lining of soles to both shoes as can be seen in picture number 10-11. WOMENS ALEGRIA BY PG LITE BLACK LEATHER SANDALS SHOES 38 Shipped with USPS Priority Mail. Pretty shoes. Nice shoes! I wear black socks so there is black die from socks inside but still Excellent! Easy slip on style. WE DO NOT SMOKE OR OWN PETS. Looking for a dark sneaker with a little mystery?. Check out the Alegria Essence in Slickery. This sneaker has a unique finish reminiscent of an oil slick or the surface of a bubble and goes perfectly with your favorite jeans or shorts. Alegria JOL-429 Black Floral Engraved Leather Clog Shoes. Adjustable hook and loop strap. Alegria Tuscany style flat floral clogs shoes. The shoes are in a cute design, dress them up or down. From the website: "Alegria Belle Desert Black is a comfortable, slim silhouette mary jane with all the comfort and style of its big sister Paloma. Slim fitting with a mild rocker bottom, this black nubuck leather upper has a crackled, distressed look. Desert Black is easily a front runner to pair with your casual or business ensemble. The Desert Black offers silver accent stitching with silver side button and velcro strap for amazing adjustability (adjustable on BOTH sides of your instep!). Alegria Belle Desert Black is also unique because of its heel bumper for added comfort. Although having a lower, mini rocker outsole, the Belle still has the wide toe box so that your toes can spread out, reducing metatarsal pressure and reducing overall foot fatigue.". Algeria size 38 shoes. They are in excellent clean condition. See pictures for details. 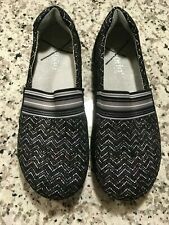 B9 Alegria JOL-429 Clogs Shoes Nurse Slip Resistant Womens Leather Etched Sz 39. Condition is Pre-owned. Shipped with USPS Priority Mail. Comfort Mary Janes. Velcro closure. Fun floral print. Great pair of shoes in almost NEW condition. Slight creasing of the toe area as expected from light wear. Slip resistant sole. The Belle is a Mary Jane on the lightweight mini rocker outsole. Weight: 11 oz. , that way I know the item has arrived. THAT WAY WE BOTH ARE HAPPY! A stretchy elastic vamp perfects the fit of a super-comfortable slip-on in supple leather. A removable cork- and memory foam-cushioned footbed with excellent arch support cradles your foot with every step, and the slip-resistant rubber sole features butterfly shaped treads. Color(s): black leather, black swirly stamp leather, chain mail leather, ethers leather, gypsy rose leather, hippie chic dottie leather, interlockin black leather, its glitz leather, monarch blue leather, quarry crackle leather, ric rac. A stretchy elastic vamp perfects the fit of a super-comfortable slip-on in supple leather. A removable cork- and memory foam-cushioned footbed with excellent arch support cradles your foot with every step, and the slip-resistant rubber sole features butterfly shaped treads. Style Name: Alegria Glee Slip-On Sneaker (Women). Style Number: 5206431. Available in stores. New with box. Size: 37 / 6. Preowned in good condition with minor wear on the toe and the bottoms of the shoes. Fit tip: This style runs wide; the roomy toe box fits like a C width.